"We loved our facilitator’s energy …she was successful in bringing in the concepts of the Five Dysfunctions to the team building." Fort Worth, known for being an authentic Texas City with a sleepy, small town feel, is a welcomes work teams to explore team dynamics while enjoying Texas hospitality. Visitors enjoy browsing the shops in The Galleria before heading off to the Stockyards for some nighttime two-stepping. The portability of our highly interactive Build a Boat program lends itself to some of the most scenic venues in Fort Worth. Consider the swimming pool and lazy river complex on the grounds of the spacious Gaylord Texan resort in Grapevine or launch your creation from the shores of Burger’s Lake, one of the few spring-fed lakes in North Texas. The competition begins when small teams collaborate to build “sea worthy vessels.” All team members use innovation and strategic-thinking skills to determine how to best use the supplies provided. 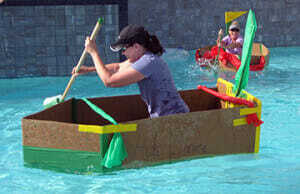 With only cardboard, duct tape and nylon, teams construct Viking ships, catamarans and kayaks that must float with a team member aboard. Cheers from your team buoy the captains as they try to safely guide their boats across the finish line before heading to a Sundance Square restaurant for a final celebration of teamwork. Our Ropes Course in the shade near DFW helps your team explore risk-taking, leadership, communication, and coaching as you leap from the top of a pole for the trapeze or fly down to ground level on the unforgettable zipline. If your meeting involves learning more about each other and sharing feedback, then consider our 360 Degree Insights workshop facilitated on a patio or in a conference room at a venue such as the Omni Fort Worth.